In addition to the problems of sluggish reforms, inadequate corruption control, and war, we have one more headache – Mikheil Saakashvili. What is more, it is Ukraine’s leadership that created this problem. It does not matter whether it was Petro Poroshenko’s own idea to invite the ex-president of Georgia to Ukraine or somebody else persuaded him to do so – in any case it is the president who makes the final decision. Saakashvili’s first steps in Ukraine were much in the interests of the Ukrainian president. Poroshenko personally handed him a Ukrainian passport, then Saakashvili played the role of a “torpedo” against the president’s opponents, such as Hennadii Korban and Arsenii Yatseniuk, although the grassroots expected him to promote reforms in Ukraine. But then things went awry. Either Saakashvili failed to get what he expected to in Ukraine, or somebody incited him to come out openly against those who had invited him, or the leadership no longer needed him, but Poroshenko withdrew Saakashvili’s passport. This caused as longtime face-off with all that this implies. What do we have as a result? ♦ Devaluation of the institution of Ukrainian citizenship. ♦ The leadership has created a problem for itself. ♦ The use of law-enforcement bodies. ♦ The constant search for a messiah and Ukrainian society’s inability to self-analyze. ♦ It is high time to learn to bank on our own professionals. What are the conclusions? Here is the opinion of journalist Illia FEDOSIEIEV. It is worthwhile to speak of the successes and failure of the “Georgian team” in Ukraine (let us further call it simply “the Georgians” for the sake of brevity) not only and not so much for the sake of this team. Something else is much more important: the history of this group of politicians or, to be more exact, administrators reflects very clearly the current state of Ukrainian society in both political and socioeconomic fields. The very emergence of this team is symbolic. The Revolution of Dignity was aimed above all against the ruling politicians who either represented or belonged to or even led certain oligarchic clans. But the revolution could not help but raise the inevitable question: who will replace them? Even Lenin, who did not exactly love elites, had to admit: any laborer or any cook is unable to rule the state. But somebody must rule it, especially if the situation is as dangerous as it was in Ukraine in 2014. “The Georgians” seemed to be ideal candidates for two reasons. Firstly, they were foreigners without any links with Ukrainian clans. This brings to mind the experience of medieval Italian communes, where the podesta (ruler) was usually elected from among people other than the citizens. It was to be an outlander who had neither relatives, nor friends, and nor enemies in the commune and therefore (at least in theory) was impartial and unbiased. In a word – just a hired manager like “the Georgians” in Ukraine. Besides, the Georgian managers had successful experience of transformations in their country – the transformations Ukraine so much awaited. It would have been a sin not to use this experience. “The Georgians” were sort of a collective Hercules at the time, who was supposed to clean the Ukrainian Augean stables which, let us be frank, stank a lot. Now, in December 2017, the stables are still far from being clean, but they are definitely cleaner than they were three and a half years ago. But where is that Hercules? The ex-president of Georgia and then chief of the Odesa Oblast Administration, Saakashvili left his office more than a year ago, slamming the door. Let us recall what he said on leaving: “Avakov and Nasirov – the pillars of corruption – remain sitting in their chairs. In reality, the president personally supports two clans in Odesa oblast: the 1990s-style criminal clan of Trukhanov and the Izmail-based corrupt clan of Urbanskyi.” In other words, they failed to hit it off, to put it mildly. He also failed to improve things in the region, for which both sides are blaming each other. Odesa police chief Giorgi Lortkipanidze also resigned together with Saakashvili. Six months before, First Deputy Minister of the Interior Eka Zguladze had resigned from office. She is the only “Georgian” who did it without a scandal – on the contrary, she said she was not going to stay in office for a long time because she had no political ambitions. It is also to her credit that she has made a major contribution to the formation of the Ukrainian national police which admittedly looks better than its Yanukovych-era predecessor, albeit it is still far from being ideal. Shortly before her, Public Health Minister Alexander Kvitashvili had been dismissed together with all members of the Yatseniuk cabinet. Although he worked no miracles in his office, he at least managed to seriously economize funds by reorganizing purchases of medicines through international organizations. A little earlier, Deputy Prosecutor General David Sakvarelidze, who had come into serious conflict with MPs, was also “given the boot.” This “outsider” tried to organize a contest-based appointment of local prosecutors, but he said Ukrainian clans had been pushing through their own people, while he himself lacked clout to hinder this. We could recall still more names ending with “dze” and “shvili,” but the conclusion is the same in most cases. Yes, a certain result was achieved, but… This Hercules was expected to perform not “some” but heroic labors. Why did he fail to do so? Take a rubber ball and press it. This will leave a dent, but once we ease the pressure, the dent will vanish and the ball will reassume its previous shape. The Ukrainian oligarchic clan system is no less resilient than this ball, and “the Georgians,” who were outsiders and had no serious organized structures to rely on, proved to be unable to exert the necessary pressure. But there still is a demand for this pressure. We must admit: now, three and a half years after the Revolution of Dignity, the problems that provoked this revolution have been solved only to a small extent. The clan system still remains, and even President Petro Poroshenko, with all due respect for him, is part and parcel of this system. Of course, this “part and parcel” itself does not matter much. Count de Mirabeau and Marquis de Lafayette were part and parcel of the old absolutist France, but this did not prevent them from becoming leaders of the Great French Revolution. The question is whether the old structure is being ruined and a new one, which meets the demands of society, is being built. Ukraine is taking steps in this direction, but they are not very big so far. Squeezed out of governmental offices, “the Georgians” have not at all disappeared from the Ukrainian political space. They are here, they are only waiting for being called. For there is nobody else to be called – all the others are part of the previous Kuchma-Yanukovych system, and their coming to power will make no major changes. “The Georgians” are very well aware of this, for they are no novices in politics. The Ukrainians, on their part, know that “the Georgians” are in no way disinterested saints who are prepared to sacrifice their lives for the common good but just out-of-system figures who know how to manage. And nothing else is required from them. Their time has not yet come but is perhaps coming up. The latest events provide grounds for this presumption. Nobody but the leadership itself is pushing the developments in this direction. 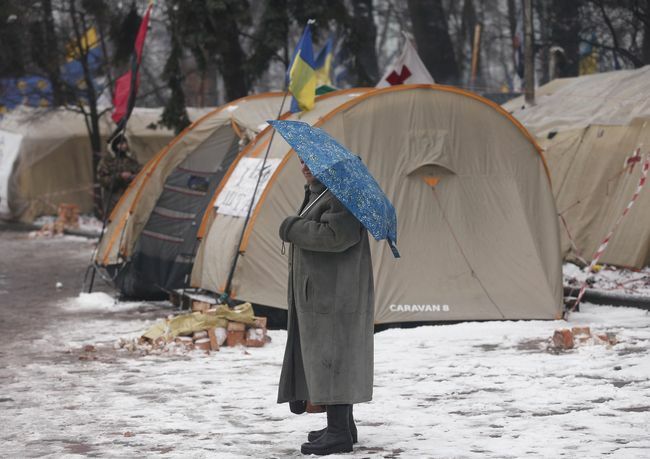 The encampment set up by Saakashvili and his supporters near the Verkhovna Rada could have provoked until recently either a sympathizing sigh or a spiteful grin, depending on political views. The leaders the Euromaidan catapulted to power could retain their positions, while the opposition of any kind could remain marginal until society reached the “flash point.” In other words, there is so far no radical contradiction between the expectations of this society and the actions of the government. For more details about this divergence, see the article “Euromaidan” in Wikipedia. As Saakashvili was seized and then freed, the situation reached a new level. In Ukraine, the opposition can only remain funny, absurd, and totally uninteresting until the government begins to apply force to it. And, once applied, violence begets retaliatory violence. There would have been no Euromaidan had it not been for the Berkut riot police. Likewise, the Verkhovna Rada plaza remained almost empty for a month and a half. But when this writer visited it in the evening of December 5, he found a big crowd of resolutely-minded people there. Is it likely that this resoluteness will produce no result and there will be no new Maidan? Yes, it is. “The Georgians,” including those who have Ukrainian citizenship, might as well remain respectable people, albeit without major political clout. This requires just a trifle: the Revolution of Dignity should be brought to a logical end – it is necessary to break the oligarchic system, eradicate corruption, establish true democracy, and do all the other things the Maidan people came out for. If the Ukrainian Eurystheus manages to do what he is expected to, Hercules will not be needed. Otherwise, Ukrainian society will soon have a very strong demand for politicians who are not linked to any oligarchic clans but are educated and experienced enough to rule the country. In all probability, there will be a lot of people other than “the Georgians,” who can deliver the goods, but the latter are still on top of the list. And can it be differently? Any revolution is, above all, a bid to resolve the problems the society faces. If one ruling team fails to resolve them, it is replaced with the second, third, fourth, and so on, one until the job is done. “The Georgians” are now pressing the current leadership in the back, subtly hinting that they will do the job better. But once they get the reins of power, someone else will soon be standing behind their backs. It is far from certain that the current political face-off will result in this kind of changes. But even if it results in nothing, the root causes of it will remain behind and make themselves felt tomorrow, in a week’s or in a month’s time. For the point is not in “the Georgians.” The point is in the current Ukrainian leadership and system. As one of the greats said, if you don’t solve a problem, the problem will solve you.